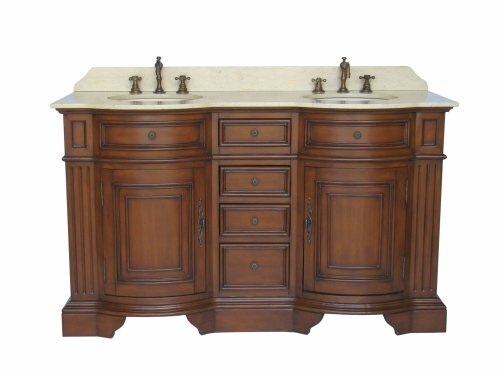 You’ve probably heard a lot about eco friendly bathroom vanities? And you might be considering one yourself, but maybe you don’t know where to start? The first and perhaps most important question to ask yourself is, what defines an eco friendly bathroom vanity in the first place? Shop co-op building supply’s and thrift stores. You may be able to refashion or recreate an existing piece of furniture into the perfect vanity for your space. Old dressers and workbenches make fabulous bathroom vanities! Or maybe make one yourself out of reclaimed wood. Re-used materials are eco friendly for the obvious reason that you are using something that otherwise would end up in a landfill. If you can’t find something used or have a different design idea in mind, no worries. There are tons of renewable materials available. Think bamboo, or other sustainable materials for the base. Consider recycled concrete, paper or glass for the top. One popular style is a bamboo cabinet on the bottom and recycled glass countertop for the vanity top. This is a great pairing and usually gives off a very modern or contemporary feel. Unfortunately there is a bit of work involved with locating eco friendly vanities for your bathroom as they are not stocked on the shelf in the big home improvement warehouses. More often than not, you’ll find these types of vanity’s by doing a bit of shopping around. This being said, it’s also worth doing a bit of browsing around online to ensure that you are viewing as many choices in the bathroom vanity realm as possible. Another approach is to search for eco friendly furniture stores online or locally. In either instance, you will likely find that eco friendly bathroom vanities may cost a bit more, but are worth it in the end regardless.